In the face of a traffic jam of recent auto recalls, it may help automotive manufacturers to also recall their industry has faced times like these before. It turns out that some auto brands come out with less brand-damage than others. But why is that? Why do some auto brands manage to steer through a recall better than others? Better PR? Better lawyers? More discounts? More advertising? More, better advertising and discounts? Not insofar as we can tell. All those things turn out to be table-stake moves right out of the “Automotive Manufacturers’ Recall Handbook: What to Do When Cars Go Bad,” with all the companies doing pretty much all the same things at pretty much all the same budget levels. So, all things being pretty much equal, we ask again: Why do some auto brands come out of a recall better than others? To a large degree, the answer can be found in a marketing model called “The Rule of Six,” which is related directly to consumers’ levels of emotional engagement, and thus loyalty, to a brand. This has been tested, re-tested, applied to B2B and B2C categories, and has been independently validated. It works like this: Brands that possess higher levels of engagement and loyalty before a crisis are six times more likely to be given the benefit of the doubt after some catastrophe transpires. Like a big recall for an automotive brand. There are other “six-times” benefits related to sales and recommendations and shunning of low(er) price offers, but in this instance, we looked at what effects the recent, problematic recalls had on the brand engagement levels of four major brands; Ford, GM, Hyundai, and Toyota. Here’s what we found. The emotional brand engagement benchmarks – the pre-recall engagement levels ­– are from our Customer Loyalty Engagement Index, where, precisely because of “The Rule of Six,” category rankings correlate very highly with positive consumer behavior toward brands. 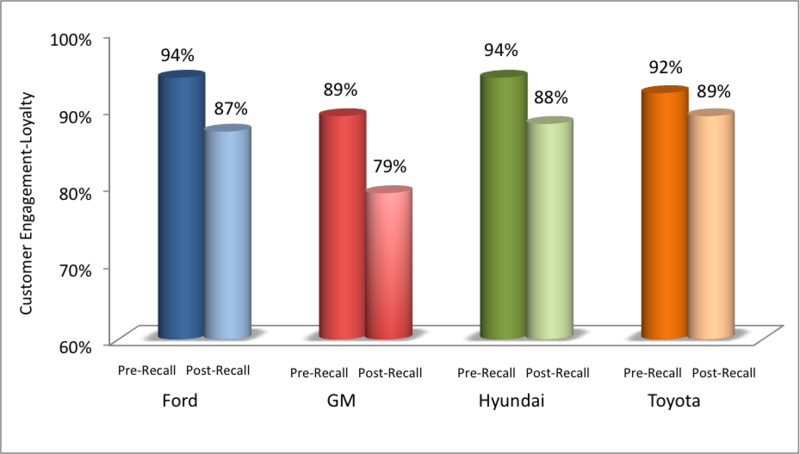 Pre-recall assessments come from the auto brand’s customers (compared to the Category Ideal, calculated to be 100%), and post-recall assessments were collected from customers who had their cars recalled. A number of years ago, for reasons we’ve previously discussed in our blogs and column, when it came to engagement and loyalty, GM was parked toward the bottom of the list of brands (about 25) we examined annually. Through lots of problems – including having to be bailed out by the U.S. government, i.e., you, the taxpayer – they managed to drive the brand up the list to find a pretty good spot, currently at the bottom of the top-third of brands, but below the other 3 brands we examined. The GM brand ended up with the biggest post-recall decline of 10%, because their own customers are, in fact, less engaged and, therefore, less inclined to give GM the benefit of the doubt. Of course, as opposed to the other brands’ recalls, GM’s ignition switch problem has been linked to 13 deaths and the fact that GM knew actually knew about the flaw for at least a decade, although, as “business is business,” it’s likely they had some calculation of what their downside potential liability was likely to be. That said, on last week’s conference call, GM CEO Mary Barra said so far the bad publicity regarding the recall of 7 million cars and trucks has not had a “meaningful impact” on sales. No, she was not standing too close to the exhaust pipe of a Chevy Malibu at the time. In fairness, it’s worth noting that she also said “. . . Although it is early. . . ,” which is an accurate observation of current conditions. Loyalty and engagement metrics are leading-indicators of consumer behavior – harbingers of what’s down the road for a brand. 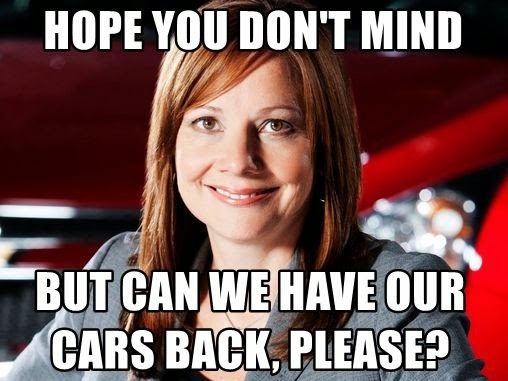 But customer engagement and loyalty assessments are not the only things down for GM. Last week GM reported net income for the 1st Quarter fell about 85% due to costs directly associated with the recall. And, we’re also guessing, staggering amounts of legal fees. Earlier last week GM attorneys asked a federal bankruptcy judge to dismiss dozens of lawsuits related to GM’s handling of the defective ignition switches and – wait for it – to bar similar cases in the future. This is related to GM trying to duck litigation based on what’s contained in their post-bankruptcy restructuring agreement. Yes, the bankruptcy bailout you paid for. Oh, and the SEC has opened an investigation too. But that was last week and, legal issues notwithstanding, the bad publicity has clearly has resulted in an erosion of loyalty and engagement for the brand and has created doubt in the minds of those who at one time had GM on their car-buying shopping lists. And you know what they say about consumers and brand-doubt. When consumers doubt, they don't.